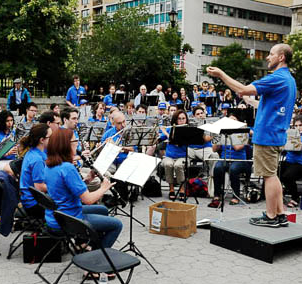 Columbia Summer Winds (CSW) was founded in 2002 in New York City and quickly blossomed into a community band with some of the most passionate musicians from across the tri-state area. Now in its fourteenth season, CSW boasts over 80 musicians each summer. CSW is committed to playing fun, family-friendly performances in parks throughout New York City, entirely free to the community. CSW’s musical repertoire ranges from classic band pieces and orchestral transcriptions to Broadway show tunes and new works from our biennial Outdoor Composition Contest. CSW supports lifelong learning and music appreciation not only through its public performances, but also through its commitment to providing its members with opportunities like Composer Night (founded in 2013) in which guest conductors clinic the band and the Outdoor Composition Contest. The 2009 Season is dedicated to the memory of Debra Silver and Dan Tedlie.